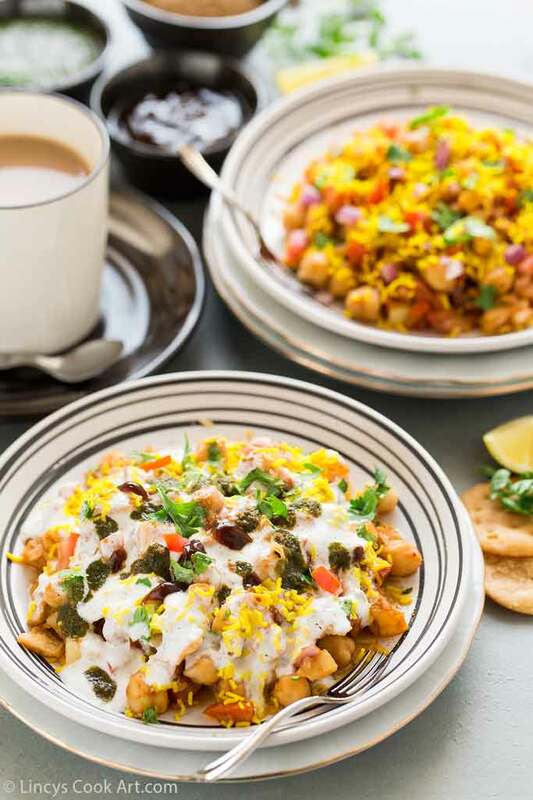 Chaats are my favourites Aloo Chana Chaat is an easy chaat recipe which is perfect for evenings with a cup of chai. 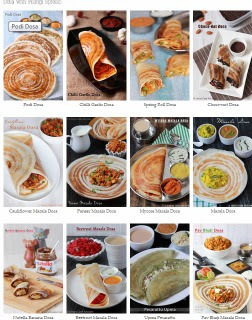 This could be whipped up in a jiffy if the potatoes and chana are cooked before hand. It is filler. A tasty and healthy snack / appetizer. 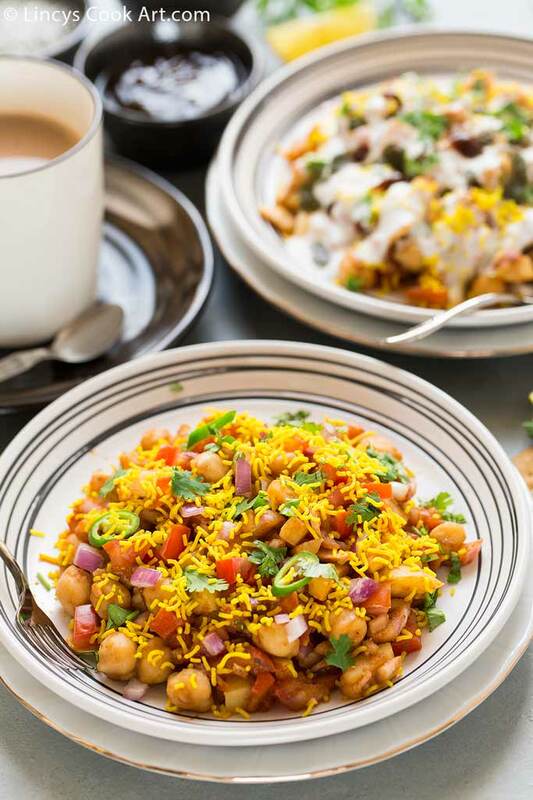 Whenever I cook chana for salad or any curries I soak and cook extra to make yummy chaats. 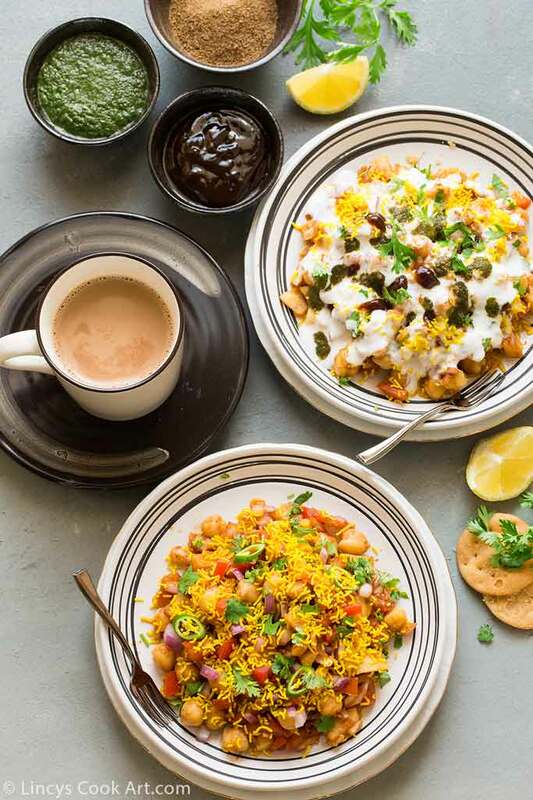 Chaats becomes tasty because of the chutney combinations used. I have posted the chutney recipes for chat two days back. So prepare them first and store them and then you could make the chaats of your choice. 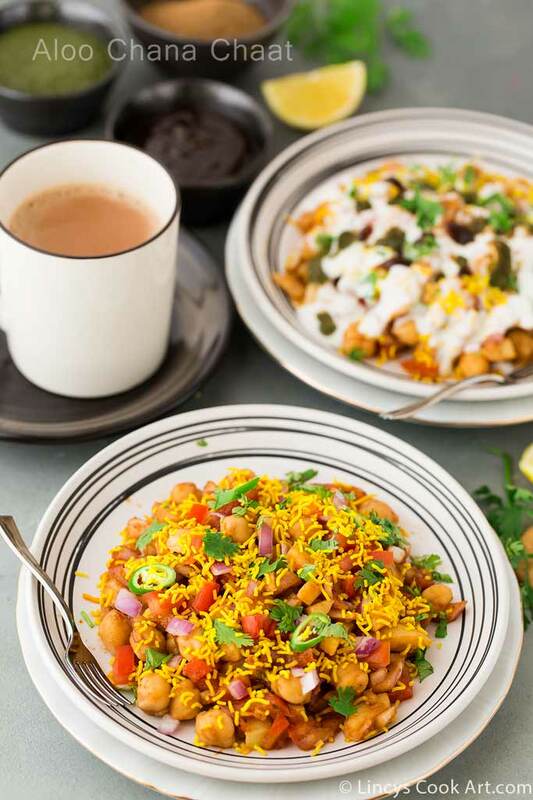 This chaat is a combinations and balance of the spicy, tangy and sweet taste which sure would tickle your taste buds. These Indian street foods tastes even better when it is home cooked! I have shared here 2 versions of this chaat with dahi| curd and without dahi make your chat as per your wish! Soak the chana overnight or minimum 6 hours. Wash the potatoes well and add the potatoes and chana together inside the pressure cooker for 3 whistles. You could cook separately too. Once the pressure releases open the pressure cooker and drain the water. Peel the potatoes and chop them in to small cubes. In a deep bowl add the cooked chana, potatoes,chopped onion and tomato. On top of that add the 3 chutneys, increase or decrease as per your taste; Mix well. At this stage you could refrigerate if you are making before hand for parties or for kids. 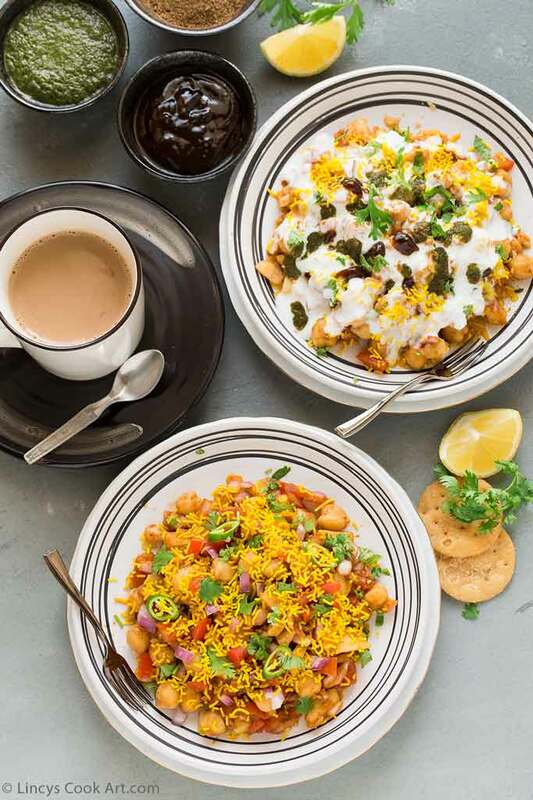 Divide the chaat into 3-4 portions and serve it on plates and sprinkle on top with roasted cumin powder, chaat masala and salt. Crush some papdis and add on top. Sprinkle some barik sev and coriander leaves and squeeze small piece of lemon juice to finish the chaat. Or else instead of lemon juice add beaten curd to serve the chaat. You could add some chopped green chilles and few drops of chutneys for garnishing the dish. I have served here this chaat with lemon juice and with dahi| curd. I have given the approximate measure ments. You could increase or decrease according to your taste. 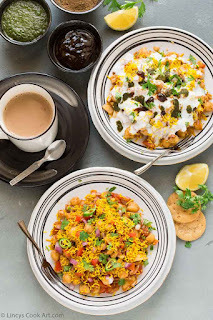 You could make this chaat with only potatoes or only with chana too. You could add finely chopped cucumber, raw mangoes too in this recipe.